For the first time in 2016, the April Spectrem Millionaire Investor Confidence Index (SMICI®) is higher than it was the same period a year ago. The SMICI rose six points in April to 11, a four-month high and a one point gain over April 2015. The Spectrem Affluent Investor Confidence Index (SAICI®) gained 1 point to 4, unchanged from April of last year.. The Spectrem Affluent Investor Confidence indices measure the investment confidence and outlook of the 16.3MM households in America with more than $500,000 of investable assets (SAICI), and those with $1MM or more (SMICI). This month’s survey was fielded between April 15 and April 21. 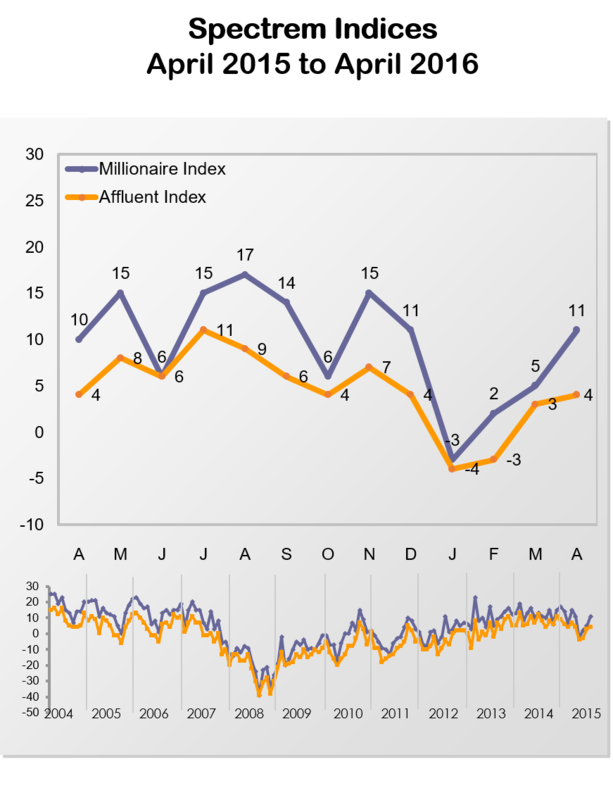 This is the second consecutive month that our Affluent Investor Confidence indices are in positive territory, and it is the third consecutive month in which each index posted gains from the previous month. An analysis of our research by gender finds marked investor confidence gaps between men and women. The April SAICI for men is at 11 compared with -7 for women (down 7 pts. from March). The SMICI for men is at 13 compared with 4 for women (a six-point gain from the previous month). Considered by political affiliation, the April SAICI for Affluent investors who identify as Independents was highest (6) in comparison to respondents who identify as Democrats (4) and Republicans (3). Each is a gain from the previous month. The SMICI is highest for Republicans (15), followed by Democrats (12) and Independents (6). A driver of the Affluent Investor Confidence indices is our monthly survey of Affluent investors as to how they would invest in the coming month. There was an increase in April of Millionaires who indicate they would invest in equities. This helped lift the SMICI to a four-month high. One factor in the modest 1 point gain in the SAICI was a slip in the Spectrem Affluent Household Outlook, a monthly measure of investor confidence in four financial factors that impact their daily lives. The Outlook was down 3.20 points to 16.60, which is 7 points lower than April 2015. Confidence in the economy fell dramatically from the previous month in both non-Millionaire and Millionaire households.